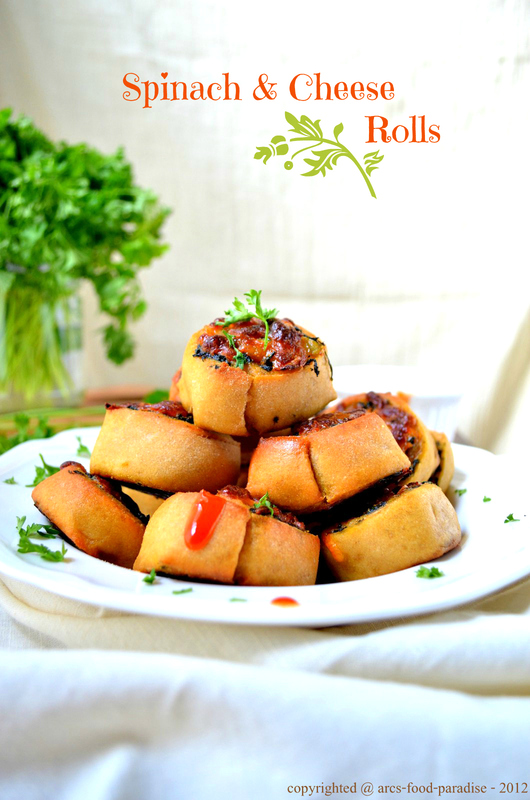 Spinach & Cheese Rolls | The Flavor Nook! We had this winter’s first snow today which reminds me of our short trip last month. 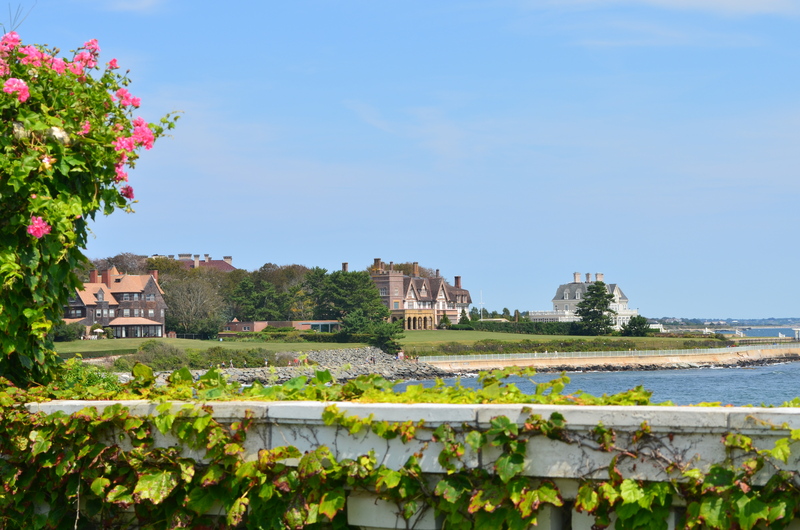 On a beautiful sunny weekend we visited Newport, Rhode Island which is just an hour from our place. We visited the beautiful and luxurious mansions and were simply blown away by the sheer magnificence The miles long shore is completely surrounded by all these huge oceanfront properties and estates which have been built way back and have been historically restored allowing visitors a glimpse of the yesteryears royalty. We were amazed by the detailed architecture, the spectacular colors inside and the landscapes of these gorgeous mansions imagining in our minds about the life back then and just wondering how breath-taking it would be to wake up everyday to such beautiful and pristine views. So, juggling in between the vast number of mansions on our list, we managed to stop over for a quick brunch at a local deli. The beautiful aroma of freshly brewed coffee and baked goodies was enough to start us off on our breakfast/lunch. There were a variety of options for us to choose from – bagels, sandwiches, buns, rolls as well as sweet treats. But, we decided to grab ‘Spinach and Cheese Rolls’ as they looked appealing and filling. And indeed they were just awesome enough to fuel us up to tour the rest of the day. This has been on my mind ever since and I finally got around making them. For these rolls, the dough is as important as the filling. For the dough, I used my go to recipe I use to make pizza crusts. I used whole-wheat flour instead of all-purpose flour to add to the goodness of spinach. 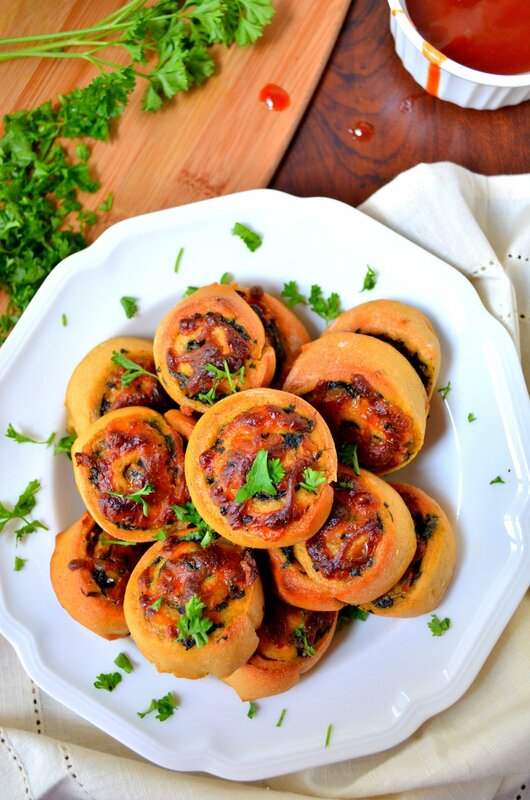 Serve these savory deliciousness warm for a weekend or even a weekday breakfast! 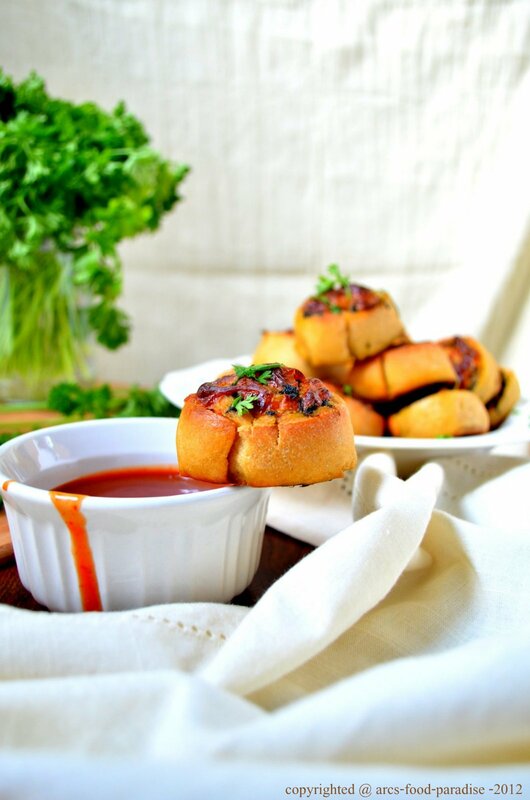 Garnish with fresh parsley and drizzle some ranch or ketchup over these rolls to make them even more irresistible! In a mixing bowl, take whole-wheat flour. Add instant dry yeast, sugar and salt. Mix everything well. Slowly add water and knead the flour into a dough. Drizzle some oil and knead again. Cover with a wet and warm dish cloth and let sit at-least an hour to allow the dough to rise. 1. Take a sauce pan with water. Bring the water to a boil and add rinsed spinach leaves to it. Blanch for a couple of mins. Remove the leaves, squeeze out any excess water, chop into tiny bits and set aside. 2. In a wide pan, heat about 2 tsps of oil. Add finely chopped onions and green chillies. Saute for a couple of mins until the onions are translucent. Add spinach, ginger-garlic paste, turmeric, red chilli powder and salt. Saute well for 3 to 4 mins. Turn off the stove and let it cool down a little. 1. Gather the prepared filling, shredded cheese and risen dough together. 2. Roll out the prepared dough into a even rectangle shape. 3. Brush some oil over the dough to keep it moist. 4. 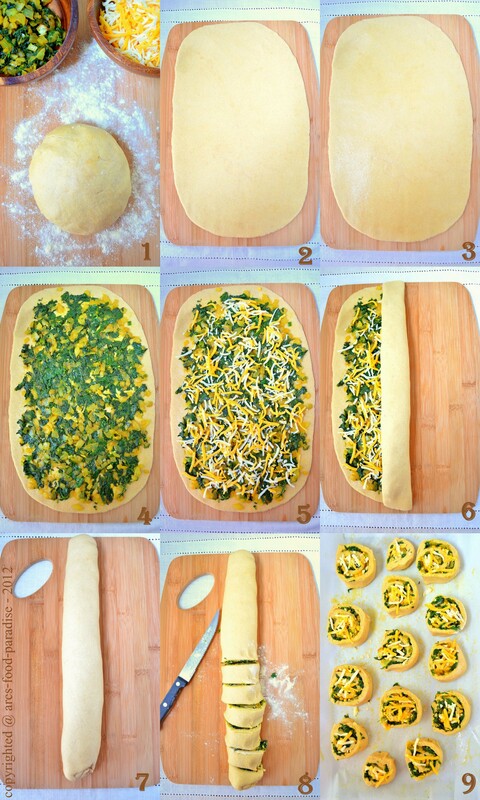 Spread the spinach filling over the dough evenly. 5. Add a light and even layer of cheese over the spinach. Leave about 1/2 inch on all sides so that the filling does not ooze out. 6. Roll the dough slowly into a long bun/log. 7. Blend the corners and press on all sides to make sure it is nice and firm. 8. With a knife, cut the dough log into 1n1/2-inch thick rolls. 9. Arrange them on a parchment-lined-and-greased baking sheet. Top with some cheese to keep them moist. Brush some oil. Cover with a warm cloth/dish towel and let them rise for about 15-20 mins. Preheat oven to 375 deg F. Now, pop these into the oven and bake for 18 to 20 mins. Serve these warm on their own or with some ketchup or ranch! Pingback: Aloo Palak – Potatoes in Spinach Gravy « Food Paradise! thank-you! 🙂 nd that is so true….bread n cheese are just so right together! Landed here from pinterest and I am so glad that I did…you have a wonderful space here, and I am loving your beautiful pictures and superb recipes. These rolls look fantastic..bookmarked ! thanks so much for your kind words! do try these out….you’ll love them!